Outdoor Advertising Methods, Tactics, and Tips. As a consumer, you will see outdoor advertising almost every day, although these days, it is harder and harder actually to grab the attention of the average customer. 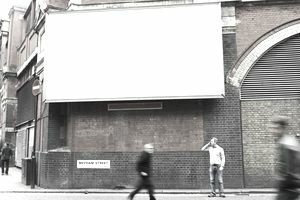 It is said that we see hundreds of outdoor advertisements every day, more if living in a city like New York or Chicago. But, recall of those ads is almost zero. So, doing it the right way is imperative, or it is simply a waste. Also known as out-of-home (OOH) advertising, outdoor advertising is a broad term that describes any type of advertising that reaches the consumer when he or she is outside of the home. It really is that simple. It can be segregated into smaller segments (explained below), but when it comes down to it, if it's outside of the home, it's outdoor advertising. Outdoor advertising is considered a mass-market medium, just like broadcast, radio, TV, and cinema advertising. For this reason, it is better utilized for broad messages, branding and support campaigns. If you are looking to do an outdoor ad, whether as an agency or for your own brand, remember that it cannot do the heavy lifting. Any attempts to do so will usually lead to a very cluttered and confusing message, and with so little time to take in the ad, it will be wasted money. Once you start putting more than 10 words of copy on a billboard, for example, you are asking an awful lot of the consumer. Many are driving past at high speed. Many more are occupied with their mobile device. So, you have to choose wisely, and also take into account the digital me that can pair with the outdoor message. Some outdoor advertising can become a focal point for an entire campaign, especially if it encompasses a stunt, or drives interaction with users and their cell phones. Recent examples include the TNT "Push To Add Drama" stunt, the tailgating ads for the Colorado State Patrol, and the Pepsi Max Unbelievable bus shelter. Make Your Outdoor Tactics Shareable: What is remarkable about the outdoor ideas you want to do? Are they inventive? Do they have 3D parts or human interaction? Do they make a statement or shock people? You want to approach the outdoor you do as something that will cause a stir; enough that people will film it and share it on social media. If it doesn't have that quality, it is not a good use of your time and money. Spend Money on High-Traffic Sites: You may be tempted to get cheaper units and more of them. It is a waste of money. The key to success is getting as many eyeballs on your outdoor campaign as possible. It's far better to do one site that will get a million views, than five sites that will get 800,000. Look at the Competition: Perhaps the best example of this comes from a billboard by Audi. It simply said "your move BMW." A week later, BMW put a billboard up across from it that said "Checkmate." You do not want to leave yourself open to ridicule or look like you're tone deaf. So, study the area, and select sites that will not pose a problem. Less is More: Outdoor is looked at for a second or two if you're lucky. You do not want to saturate the ad with messages and calls to action. Keep it simple, and let the few words and stunning visuals grab the attention. Think of outdoor as a conversation starter only. It is not there to inform, but merely to intrigue.